Pete Goodell was raised in a big family here in California, where he early on developed an interest in field ecology and biology. His long-term efforts in cultivating field research skills in biology, nematology and entomology have served him well over the years, and have helped him and cooperators develop options and workable solutions for a wide range of new, developing and ongoing pest management problems. After completing a Bachelor’s degree in Ecology/ Field Biology at San Francisco State University, he jumped into agricultural research by signing on to collect insect samples in Los Banos area cotton fields early in his career. Pete described it as a job that “got me outdoors and was very satisfying” and one where “I was able to use a lot of what I learned in field biology at San Francisco State”. That job helped expand his interest in agricultural entomology, and he continued his education at University of CA, Riverside, obtaining an M.S. degree (1979) and Ph.D. degree (1986) in Nematology and Entomology. Close to the time that Pete finished his formal education at the University of California, the state of California started to implement new regulations aimed at reducing pesticide use, and state funding helped the University of California to create the UC Statewide Integrated Pest Management Project (UC-IPM). Goodell was described by Frank Zalom, former UC-IPM Director as “a key player in getting UC-IPM off and running, being a member of the first team of academics hired to conduct research and extension education to address some of these mandates of the state of California while keeping a focus on what might actually work for agricultural producers”. UC-IPM was developed as an interdisciplinary program and for multiple crops, Pete both led and served as part of a team of researchers and educators who conducted research, came up with best management practices and summarized recommendations that took the form of IPM manuals, books, leaflets, training resources of all kinds, and more recently, website posts and blogs. His research and education efforts have been diverse and demonstrate a wide range of capabilities and interests, including the development of management tools for lygus and root knot nematode, analyses of landscape ecology and cropping systems changes that impact the approach to consider (what works and what might not) in regional IPM strategies covering areas much larger than individual farms, developing strategies for aphid and whitefly control for sticky cotton prevention, GIS technology and mapping as part of analysis for regional pest management, and the development and use of computer programs for crop and insect management. In his career, Pete has repeatedly been called upon to help develop strategies for management of new or expanding pest problems in multiple crops, including pest identification, assessments of economic impacts, and dealing with requests for assistance in pesticide registrations. Field research of his own and in cooperation with others has provided a diversity of pest control options in multiple crops, but in addition, Pete has demonstrated over the years a true appreciation of the knowledge of PCA’s and other industry professionals and the value in listening to and working with them to better understand the realities of field situations and considerations if you want to implement useable management strategies. Within the IPM program he has served multiple roles in addition to Area IPM Advisor, including IPM Extension Coordinator, Associate Director of IPM at Kearney Ag Center, and multi-year roles as Interim Director and Co-Associate Director of the UC Statewide IPM Program. Many innovative ideas came out of a wide range of UC-IPM efforts, and multiple colleagues expressed their appreciation for Pete’s numerous efforts to try new approaches in extension education, implementing the social sciences and alternative information delivery approaches to see how people might best learn about and adopt pest management strategies. 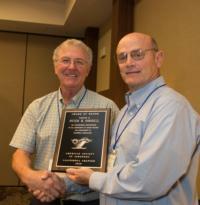 Dr. Goodell has received multiple other awards in addition to being made an honoree of the CA Chapter of the American Society of Agronomy, including two Distinguished Service Awards from UC Agriculture and Natural Resources, CDPR IPM Innovators Award, Entomological Society of America Pacific Branch Award for excellence in IPM, and Lifetime Achievement awards from the Association of Applied IPM Ecologists and from California Cotton Growers and Ginners Association. Pete will likely be a very active retiree, with many interests related to his more time to spend with his family, his passion for more exploration of the Sierras and the great outdoors; as well as the fact that he applied for emeritus status with the University so that he could continue work on key projects that interest him. As most of us have experienced, Pete often concluded his presentations with beautiful photos from some of his hiking and backpacking adventures, so get out there and you will probably cross paths in the future.